When the reigning NBA MVP took the court against the Nets Wednesday night at Toyota Center, he was just three games short of matching Chamberlain's 20-game streak with at least 30 points. HOUSTON — Way back in 1964, Wilt Chamberlain accomplished the feat of scoring at least 30 points in 20 straight games in the second half of the 1963-64 season and no one has done it since. And that actually happened two years after he averaged a record 50.4 points for the 1961-62 season. 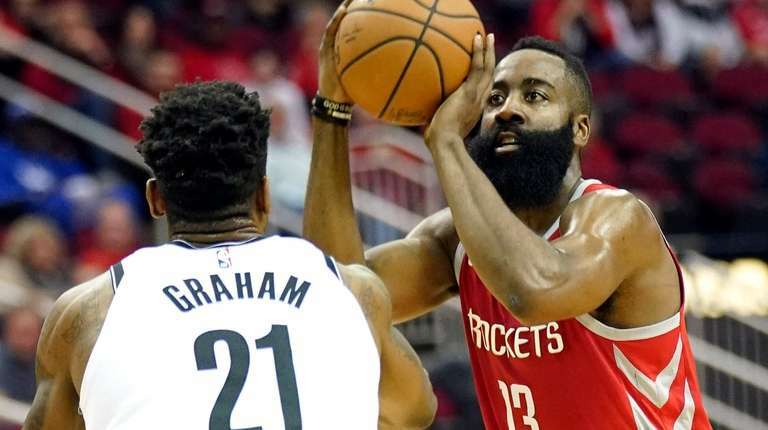 When reigning NBA MVP James Harden took the court against the Nets Wednesday night at Toyota Center, he was just three games short of matching Chamberlain’s 20-game streak with at least 30 points. In his previous game, Harden scored 36 in the first half alone on his way to 57 in a victory over Memphis. Over his 17-game streak, Harden was averaging 41.3 points. For the entire season, Harden was leading the NBA with 34.8 points per game, fourth in assists at 8.6 and fourth in steals at 2.05 and he was averaging 6.3 rebounds. The only previous player ever to average at least 30 points, 8.0 assists, 5.0 rebounds and 2.0 steals was Michael Jordan in 1988-89. So, Harden has reached a special plateau this season, and Nets coach Kenny Atkinson described him as the “ultimate challenge” for any player to guard. The Nets started out with Treveon Graham covering Harden, but Atkinson also tried rookie Rodions Kurucs, Joe Harris, Spencer Dinwiddie and even center Jarrett Allen. The coach said the return of a healthy Rondae Hollis-Jefferson from a seven-game absence for a groin strain also figured to help the Nets’ multi-faceted plan for trying to contain the Rockets star. “It’s the ultimate individual challenge for the guy that’s guarding him,” Atkinson said. “Now we have to have a team behind him that’s going to help, but if you help too much, now you’ve got Gerald Green getting eight threes and P.J. Tucker and those guys. It’s just finding that balance. The “kitchen sink” approach Atkinson planned included a dose of zone defense that the Nets have used in several games recently, and it has helped fuel the 14-5 mark they put together in the previous 19 games. The used it successfully in a win over the Celtics on Monday. Atkinson joked that the Nets’ zone, which usually starts as a 2-3 matchup zone, is so confusing that it even confuses the Nets. The problem with using a zone against the Rockets, however, is that they are the most prolific three-point shooting team in the NBA. Even when the Nets got the ball out of Harden’s hands, the Rockets spaced the floor with four other three-point shooters who were capable of knocking it down.